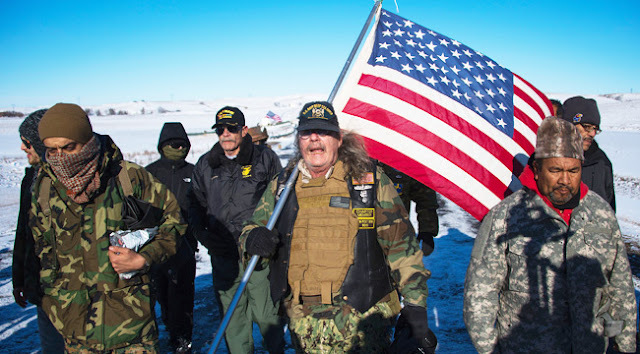 Responses to "US Veterans to return to Standing Rock after Dapl decision to continue"
So grateful for this service that they and the other protectors are doing for the people and the earth. I have tears of gratitude and will be sending what aid I can. I support the Standing Rock cause. I believe that this is one of the most important cause of all. And also believe that the Water protectors have been since last april a model for a lot of us in peacefully protecting the water of the Missouri river. Greatful for those great people. This is the best news I've heard in weeks. Stand strong, water protectors, reinforcements are coming!! Thank you to our wonderful Vets, the best of America. We stand with Standing Rock! To all that have served and continue to serve the American people, I applaud you for your bravery, integrity and compassion. We stand with you! Thank you vets and water protectors; god bless! i know every one loves their water.. with all respect. i am a vet too. how many bridges today goes across creeks and rivers . that also have sewage and fuel and oil and other things going under them and along side them.. even as far north. of this river.. . i love the Indian people and your ways i my self love buffalo eat it all the time.. best meat. but please be wise and be smart. my dear lady friend told me alot even people messing with Indian graves.. i know that is to be untouchable. god bless you all.. in Jesus name. stay save and warm..
May wisdom and strength be yours. Thank you for your honor and conscience. Tears of gratitude, blessings to all of you who are risking your lives to defend those who cannot defend themselves. Your mission statement could not be more appropriate for these times. Thank you for your service and support for the people. Thank you for your continued service. Our prayers go out to all. 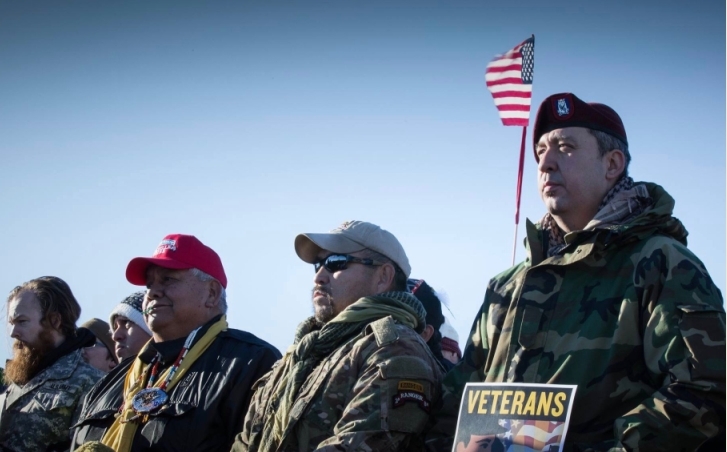 THANK YOU TO ALL OF THE VETERANS THAT SUPPORT OUR PEOPLE FIGHTING FOR THE WATER THAT WILL SUSTAIN EVERYONE FROM THE YOUNGEST TO THE OLDEST ALONG THE BANKS OF THE ALL MIGHTY RIVERS THAT RUN THROUGH OUR COUNTRY. MAY CREATOR BLESS ALL THAT ARE INVOLVED IN THIS JOURNEY TO PROTECT ALL OF OUR WATERS. When we stand together great things will happen. Thanks for your service and hearts! Names of Tribal Vets in image: Harvey Moses Jr. (red baseball cap), Larry Allen (tan baseball cap), and Joaquin Marchand (red beret). All are enrolled members of the Colville Confederated Tribes (WA state) and Army combat veterans from Vietnam to Iraq/Afghanistan. Our people will always fight for this land, and support our brothers and sisters who protect the land and our resources. Prayers for all Water Protectors! Prayers & Blessings from a fellow Vet! May our Mighty Creator watch over each and every one of you - standing for & with The People & resources for all of us & future generations! When are you headed there? I am also a vet and plan to go to give medical support this weekend. I am not in a position to be with you there. But would like to support and work for divestiture in all banks supporting DAPL. If the banks realized the impact of a ban on all banks supporting DAPL, perhaps they would back down on this destructive,unjust destruction of this earth and the people that depend on the water. I applaud the veterans and all efforts to stop this injust cruelty to our earth. Though DT admin may not understand the poetry of the vets standing for standing rock, people all over the world do, and it's very moving. Thank you for choosing to lead - we are desperate for leaders, and many people are ready to stand with you - wherever they are. Thank you Thank you! We need VIRAL NOW! Please share on your time line! Can you please share this with the people? CALLING ALL PEOPLE ACROSS OUR NATION ACROSS THE WORLD! IF YOU, can not make it to stand at Standing Rock with those standing tall, BE AT YOUR LOCAL COURTHOUSE at 8am Dakota Time! Just what if we who have a voice on this all stood on ground before their local court house steps at 8 am Dakota time as a symbol of the injustice? Have a voice? USE IT. Please NOW IS THE TIME! PLEASE SHARE!! !